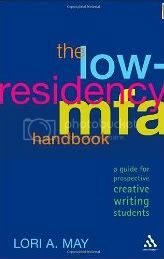 I am one of several Seton Hill Writers who contributed to the Low-Residency MFA Handbook: A Guide for Perspective Creative Writing Students by Lori A. May. This guide offers prospective graduate students an in-depth preview of low-residency creative writing MFA programs, as well as interviews with program directors, faculty, alumni, and current students. Lori is a part-time writing instructor and a member of the AWP, MLA, and the Michigan College English Association. She is a frequent guest lecturer and workshop presenter at writers' conferences and graduate writing programs. In addition to her freelance writing, Lori is the author of Moving Target (Athena Force), The Profiler, and stains: early poems. More information about her is available online at www.loriamay.com.